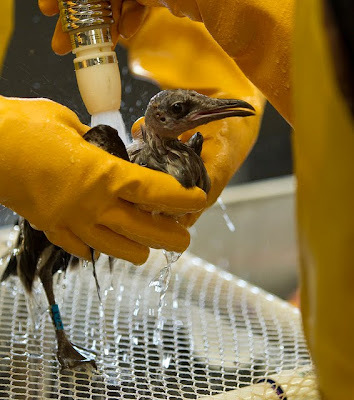 Technicians cleaning birds at the Fort Jackson Oiled Wildlife Rehabilitation Center near Fort Jackson, Louisiana on Wednesday, 21 July, 2010. The center is moving further inland to Hammmond, Louisiana on Friday, July 23. How many millions of birds should BP clean in order to clean their oil spilled image? at least they do it! Doing the right thing is a choice! Accidents happen - and when they do you have to do everything to make amends. For this helpless bird it's a good day today. I'm glad that they are trying but I heard a radio program the other day re. cleaning birds and unfortunately the survival rate of these (cleaned) birds are extremely low. Most die within 9 days of release. I was surprised too. Quite sad. My hope is that this event acts as a turning point if not to alternative energy at least to come up with more strict protocol regarding safeguarding against such incidents.